Can you confirm these amateur observations of Cnemaspis kottiyoorensis? Types Holotype: TNHM (H) 13.7.06G80, Adult female collected under a stone by Vivek Philip Cyriac, 13 May 2013. Paratypes. TNHM (H) 13.7.06G81, adult male collected from the same locality as holotype, from under a log by Vivek Philip Cyriac, 13 May 2013; TNHM (H) 13.7.06G82, adult male collected from Chandanathodu (11°50'47.81'' N 75°48'32.76'' E), Periya Reserve Forest, Wayanad by Vivek Philip Cyriac and Umesh Pavukandy, June 2013; TNHM (H) 13.7.06G83, adult male collected from Makkimala Reserve Forest (11°52' 10.91'' N 75°57'02.51'' E), Wayanad by Vivek Philip Cyriac, July 2013. Diagnosis Diagnosis. A medium sized robust Cnemaspis with a maximum snout-vent length of 41.65 mm. Dorsal scales heterogeneous consisting of granular scales interspersed with more or less regularly arranged longitudinal rows of keeled, conical tubercles running down the back. Nasals separated from each other by two supranasals and a long internasal. Nasals bordered posteriorly by four postnasals and in narrow contact with first supralabials. Mental scale subtriangular, bordered posteriorly by widely separated enlarged postmentals, separated from each other by 1 – 3 small median scales. Supralabials 6 and infralabials 6 – 7. Subdigital lamellae on digit IV of manus, 19 – 20 and on digit IV of pes, 20 – 21. Femoral pores ranging from 4 – 5 on each side. No pre-cloacal pores. Tail sub cylindrical in cross-section and lacking whorls of enlarged tubercles on the dorsal aspects. 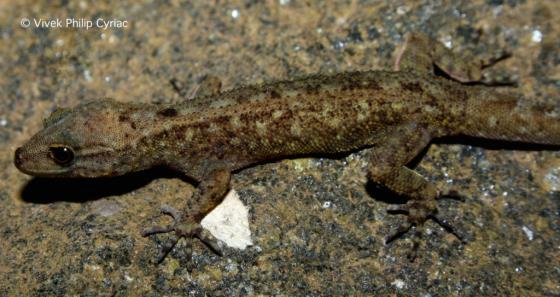 Dorsal scales of tail granular and smooth. Ventral scales of tail smooth, larger than the dorsal scales. Median subcaudals larger than adjacent ventral scales of tail; anterior subcaudals uniformly arranged, subhexagonal; distal subcaudals irregular with a large hexagonal scale alternating with two rows of smaller scales. Cnemaspis kottiyoorensis sp. nov. differs from all other Indian congeners by the following characters: Absence of spine-like tubercles on flanks (vs. spine like tubercles present on flanks in C. goaensis, C. littoralis, C. mysoriensis, C. jerdonii, C. indraneildasii, C. otai, C. yercaudensis, C. wicksii, C. andersonii, C. monticola, and C. nilagirica); presence of 4 – 5 femoral pores and absence of pre-cloacal pores (vs. presence of only pre- cloacal pores in C. beddomei, C. ornata, and C. nairi; presence of both femoral and pre-cloacal pores in C. goa- ensis, C. mysoriensis, C. indraneildasii, C. otai, C. yer- caudensis, C. wicksii, C. andersonii, and C. australis; presence of a continuous series of 24 – 28 precloacal- femoral pores in C. kolhapurensis; absence of both femo- ral and pre-cloacal pores in C. boiei ); tail without caudal tubercles; no post-cloacal spur; median series of subcaudals enlarged, sub hexagonal and smooth (vs. median subcaudals not enlarged in C. gracilis and C. andersoni; post-cloacal spur present on either sides in C. goaensis, C. mysoriensis, C. kolhapurensis, C. indraneildasii, C. otai, C. yercaudensis, C. andersonii, C. monticola, C. australis, C. beddomei, C. ornata, and C. nairi; median subcaudals enlarged, arranged as a single large scale alternating with two smaller scales in C. sisparensis and C. heteropholis ). Cnemaspis kottiyoorensis sp. 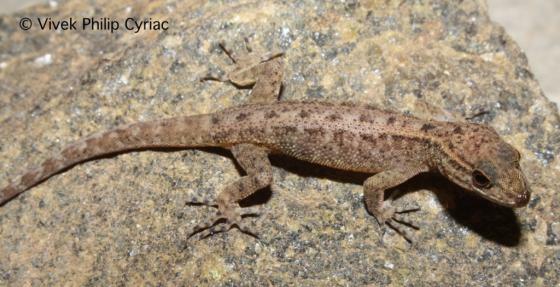 nov. closely resembles C. wynadensis in size, coloration, and general morphology (Fig. 1). However, C. kottiyoorensis sp. nov. can be distinguished from the later by the presence of series of enlarged conical tubercles intermixed with the small conical dorsal scales on the body which is absent in C. wynadensis (Fig. 2). In C. kottiyoorensis sp. nov. the supranasal scales are separated from each other by a long interna- sal scale while the internasal scale in C. wynadensis is significantly short. The sub-digital lamellae of the IV digit ranges from 19 – 20 on the manus and 20 – 21 on the pes in C. kottiyoorensis sp. nov., but is slightly lesser in C. wynadensis and ranges from 15 – 16 on the manus and 18 – 19 on the pes. Etymology The specific epithet is named after its type locality, Kottiyoor, which is a Reserve Forest in Kannur district of Kerala State. The area is proposed to be elevated to the status of a Wildlife Sanctuary.